The Grand Challenges facing society currently require research that transcends disciplinary boundaries, requiring an increased flexibility in the ways we seek to understand the world and the ways we prepare students for the future. The School of Science Reception is located in E Block, E.2.20. The School of Science is home to the Bachelor of Science (BSc), an internationally recognised general science degree, and the Bachelor of Science (Technology) (BSc(Tech)) will help put you on the first step of your career ladder, giving you valuable paid work experience alongside practicing scientists and technologies. We have a wide-range of science subjects to choose from. Our progressive and innovative subject range allows our graduates to meet the needs of regional industries and to contribute to the development of the national and international knowledge economy. Find out more about the staff in the University of Waikato's School of Science. Interested in studying science at the University of Waikato? Want to experience our facilities and campus without leaving home? Now you can - simply view the video below. 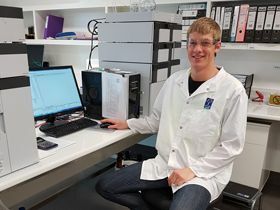 Join past student Aaron Huesser as he gives you a taster for what it's like to study science at Waikato.